I got this cooking book “Nutritious Recipes for Children” from my brother-in-law (THANK YOU!!). It is a wonderful cooking book that involves lots of traditional Chinese herbs. I have not much knowledge about Chinese herbs and this book is loaded with easy recipe and explanation of usage of each herb. I love to experiment with different ingredients and expand my knowledge. Most of us most likely know what walnuts and black sesame seeds are, but may not heard much about using Dried Lily Bulb in cooking. This is also my first time using Dried Lily Bulb in cooking. I’ve seen this a lot at Asian Grocery store and never really knew what I could use it for. Dried lily bulbs or called bai he in Mandarin, come from the scales of the bulbs of a tiger lily flower. This Chinese herb is commonly used as ingredient in a number of dishes, including sweet congee, soups, and desserts. It can also be used in making tea, sweetened red bean paste, and fish paste. 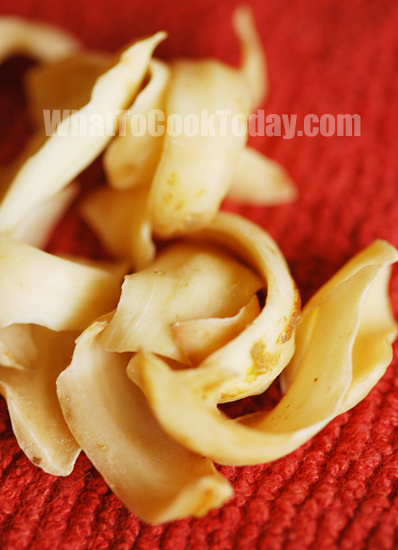 Dried lily bulbs are known for its analgesic properties. Chinese medical practitioners typically use them to moisten the lungs to stop coughs and sore throats. They are also used as an ingredient in certain patent medicines, most of which are anti-flu medications. According to the cook book, the combination of ingredients in this recipe is meant for improving memory. 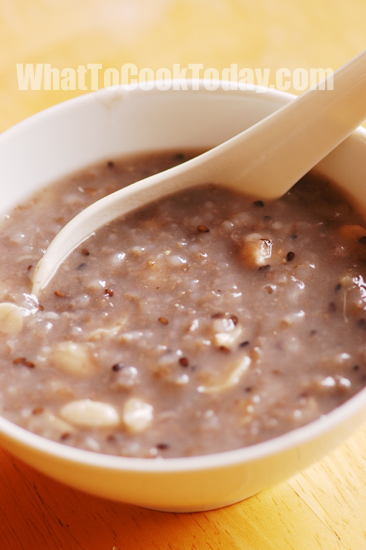 The herbalist who wrote this book suggested to serve this congee twice a month.